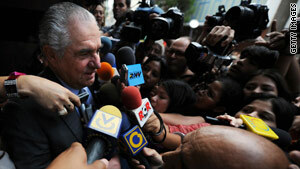 Guillermo Zuloaga speaks to journalists after presenting himself at the district attorney's office in Cararas in 2009. (CNN) -- The Venezuelan government has issued an arrest warrant against the president of one of the last independent TV stations in that country. Guillermo Zuloaga, president of Globovision, is accused of illegally storing vehicles with the intent to sell them for a profit, the government said Saturday. His son, also named Guillermo, is also wanted. With cameras from Globovision rolling, police searched Zuloaga's home. His whereabouts are unknown. His lawyer Perla Jaimes, told CNN that Zuloaga will have to make a decision as to how and when turn himself to the authorities to face the charges. The charges against Zuloaga originated in May 2009 when 24 vehicles were found in one of his properties in Caracas that, according to the government, were being kept there in violation of existing law. This is not the first time Zuloaga has faced arrest. In March, he was detained as he returned to Venezuela -- accused of criticizing the government during a public forum outside the country. Globovision is one of the few remaining independent media outlets in Venezuela and is often critical of President Hugo Chavez. The arrest warrant was condemned by human rights and freedom of the press groups who considered it a renewed attempt to silence critics of Chavez.